Beauty of the skin is more then SKIN DEEP! The skin performs a variety of functions. We may spend a lot of time preparing our dead skin cells to look their best for the world, but your skin does a lot more than just give you an attractive face! Let's take a look at the ways your skin is hard at work to keep you movin' and groovin' throughout your day! The primary function of your skin is to protect your internal organs and soft tissue from the outside world. It provides a barrier that is able to withstand some wear and tear. It can get bumped, bruised or scraped and it is able to heal relatively quickly. 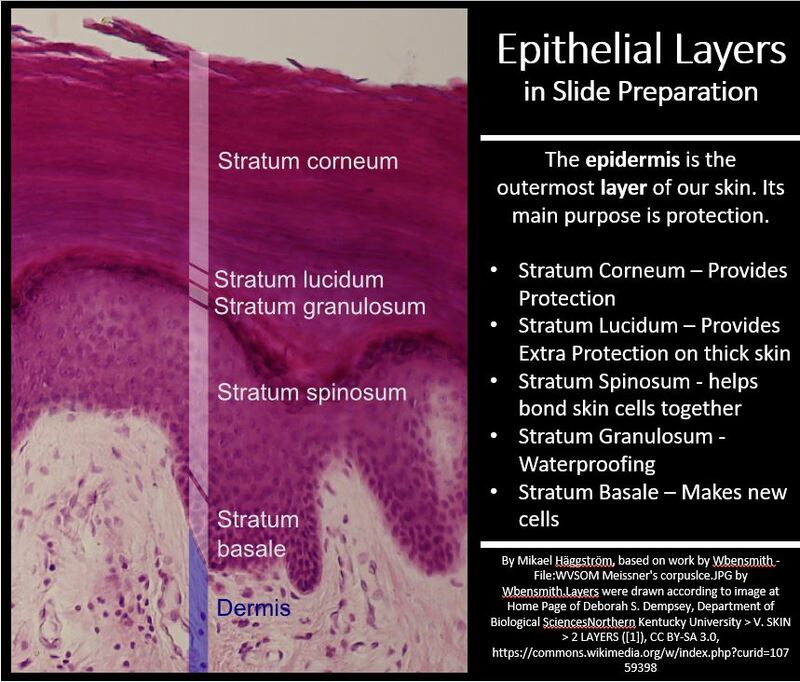 This is because the epidermis is composed of stratified squamous tissue which provides layers of small, easily replaced squamous cells. The barrier of your skin also protects you from harmful elements like bacteria, viruses, chemicals and even contains melanin (within specialized cells called melanocytes) which provides protection from harmful UV radiation from the sun. Skin also prevents excess water loss from the body. Your skin helps control your body temperature. When you are getting too hot, the skin reacts by activating sweat glands to secrete sweat that helps your body cool down. Your layers of adipose tissue (fats) helps the internal core body to keep warm. In extremely low temperatures, the blood flow to your extremities is restricted to conserve warmth toward the core of the body where vital organs are located. You sweat, but what is it? Your sweat is made of urea, salts, and water. Not all UV radiation is bad for you. Your skin actually does need a small amount of UV rays from the sun to produce valuable vitamin D. Vitamin D is necessary for the body to absorb calcium from your digestive tract. The skin gathers sensory information about the outside world that gets relayed to the brain. Your skin has sensory receptors for temperature, touch and pain. 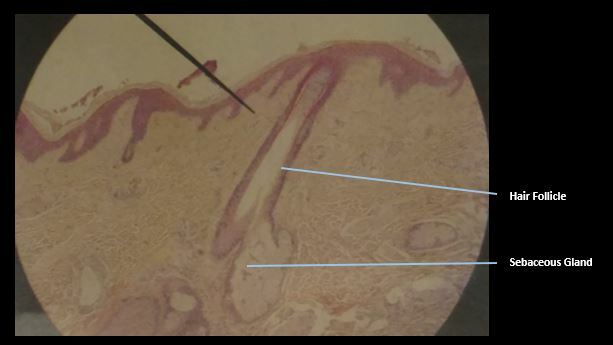 Epidermal tissue is categorized as a keratinized stratified squamous epithelial tissue. The most abundant type of cell found in the epidermis are keratinocytes. Keratinocytes produce keratin which is a fibrous protein that gives strength to epidermis. The keratin protects the deeper tissue layers not only by providing a physical barrier to the outside world, but they provide antibiotics. and enzymes that act to detoxify the harmful chemicals to which our skin is exposed. 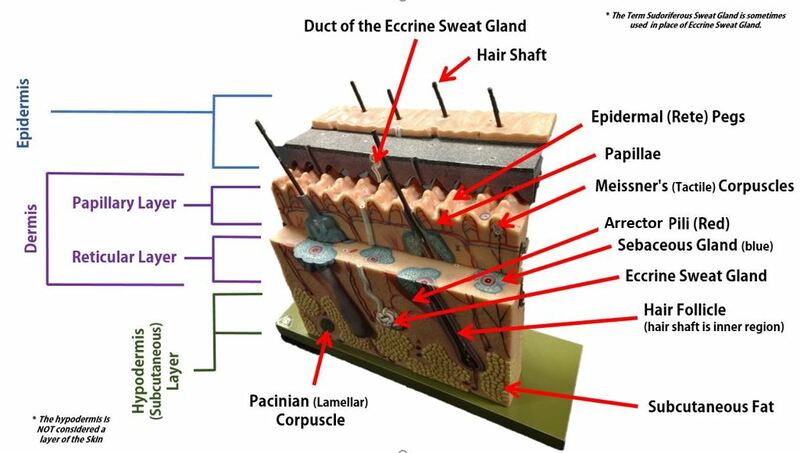 Keratinocytes form in the deepest portion of the epithelium (the stratum basale) and then are continuously pushed outward until they die and eventually get sloughed off of the body. We loose millions of these dead skin cells every day! 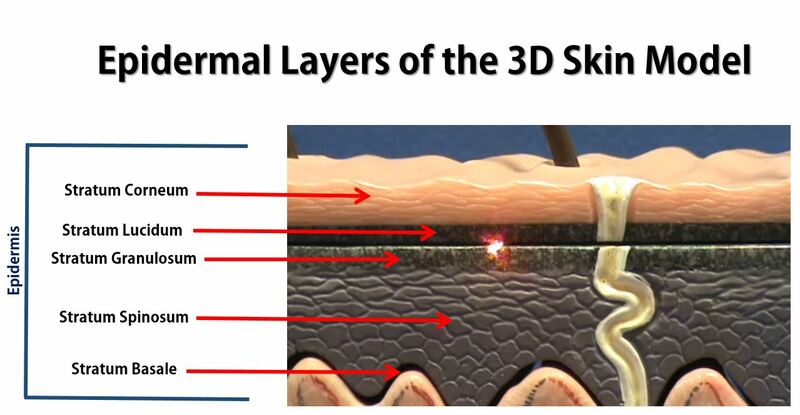 your epidermis is completely replaced every 35-45 days. The keratinocytes undergo physical changes as they mature and move closer to the surface of your skin. The keratinocytes are created from stem cells that exist in the stratum basale. As these cells are pushed up by the production of new cells beneath them, they make their way to higher (more apical) epithelial layers. When the keratinocytes reach the stratum spinosum (the layer superficial to the stratum basale) they begin to produce keratin. 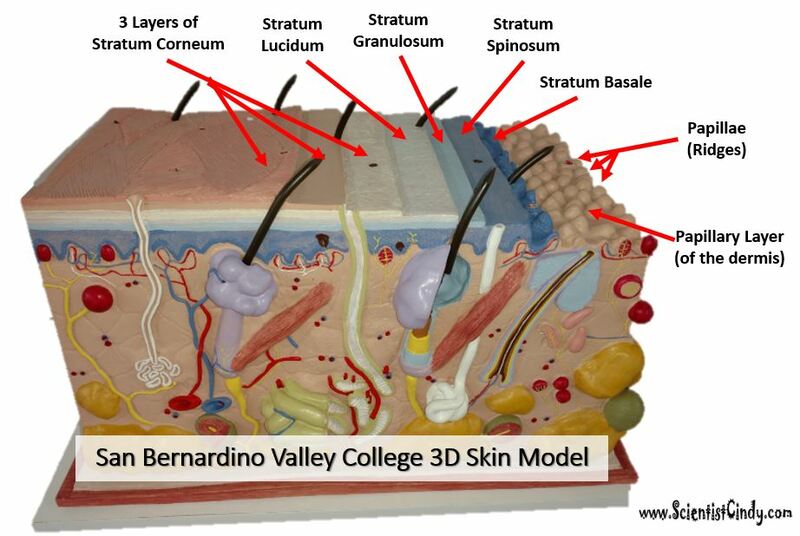 Once they reach the stratum granulosum, these cells are busy making lots of keratin which fills their cytoplasm. The keratinocytes begin to die as they become part of the stratum lucidum, becoming smaller and clear. They begin to loose their organelles as they die. By the time these dead keratinized squamous epithelial cells reach the skin's surface, they are completely dead and are characterized as "corneocytes". The corneocytes are basically dead, flat sacs completely filled with fibrous keratin. There are no blood vessels in the epidermis, so the epidermis does not have its own blood supply. 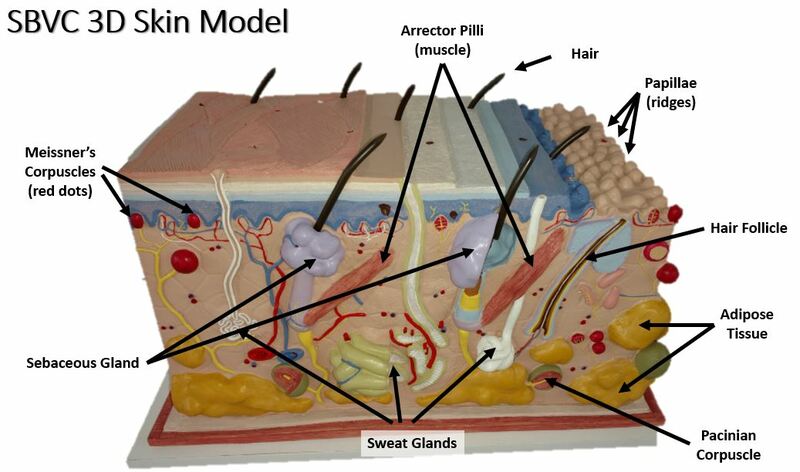 The epidermis get nutrients and gasses , oxygen, and vitamins travel to the epidermis through the rete pegs, which are made up of a network of very small blood vessels that project down to the dermis layer. 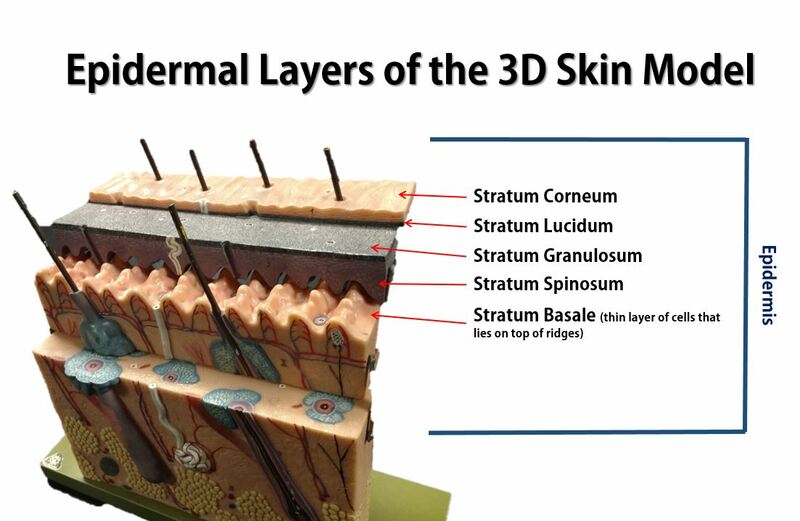 Stratus Basale - Translate as "basal layer". The stratum granulosum is Latin for granular layer. n this layer, the keratinocytes have become squamous cells that contain granules of keratohyaline, a precursor to the extracellular keratin that protects the skin tissue from abrasion. 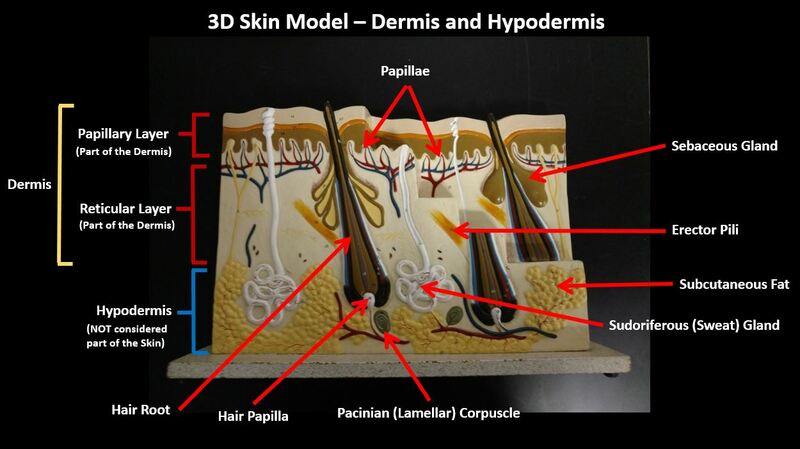 The epidermis consists of 4 cell types. Keratinocytes - The most abundant cell type in the epidermis. They are created in the stratum basale and pushed upward toward the skin's surface. 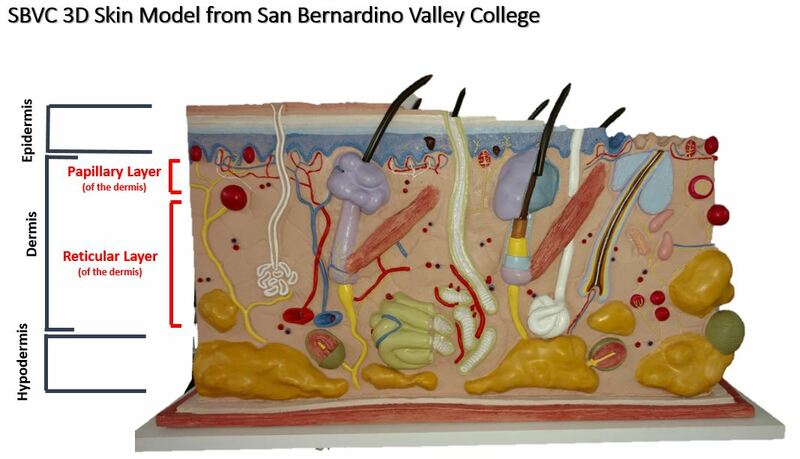 These cells make keratin and act to protect deeper layers of soft tissue. These cells die as they approach the surface of the skin. Once they are dead and shriveled up, they are called corneocytes. Melanocytes - Pigmented cells of the stratum basale region that produce melanin which protects from UV radiation. ​Touch receptors of the skin. Your skin has specialized sensory receptors called touch (tactile) receptors or mechanoreceptors which responds to mechanical pressure or distortion by generating a signal that will ultimately reach the brain.